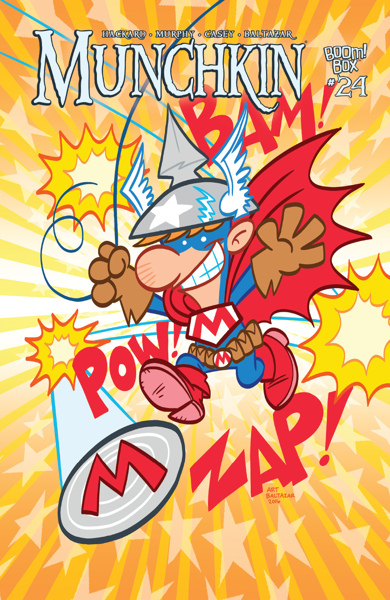 Daily Illuminator: Munchkin Comics #24 Will Swoop Into Stores Soon! Mwah! December 20, 2016: Munchkin Comics #24 Will Swoop Into Stores Soon! Mwah! 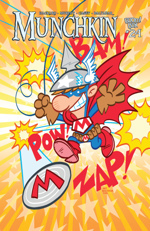 Sometimes, Munchkin comics from BOOM! Studios answers the real questions we all have in life. Questions like, "What would it be like to go on dates with the monsters from Munchkin?" And in this case, the answer is . . . Annoying. 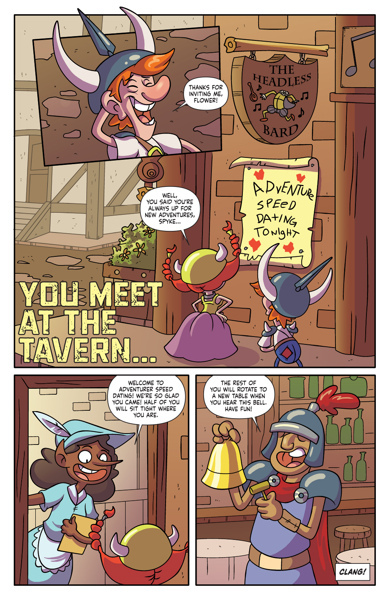 At least, Spyke and Flower seem to be annoyed by their speed-dating experience in "You Meet At The Tavern…", a story penned by Munchkin Czar Andrew Hackard and drawn by Phil Murphy. Turns out Ghoulfiends, Net Trolls, and Maul Rats aren't exactly sparkling conversationalists. Neither Spyke nor Flower reacts well to their series of bad dates. But that's okay; in the end, they both return to what they really love. And that's what this issue is all about: Love. And Munchkin Valentines. But mostly love. The comic's second story answers another question entirely: "How do you superhero?" You'll have to read the issue to get a step-by-step answer, written and illustrated by Art Baltazar. It's very detailed. It even tells you how to handle your laundry. Will it prepare you for real superheroing? Maybe. Will it prepare you for playing Super Munchkin Guest Artist Edition? Yes!